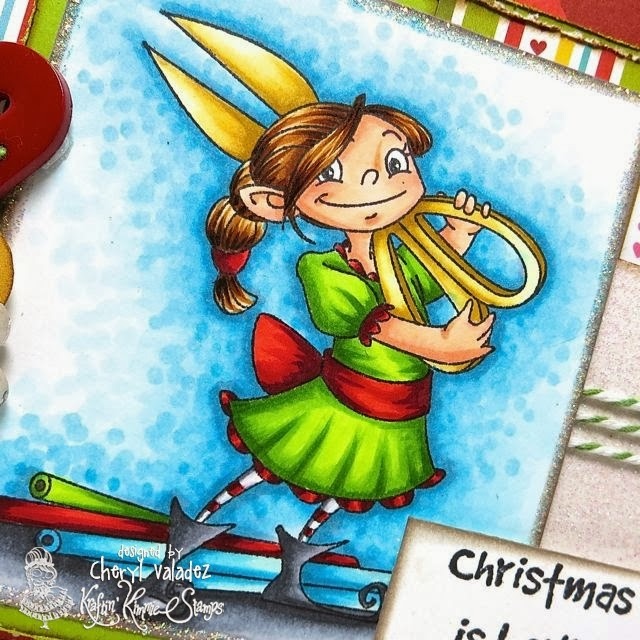 The Ink Trap: Kraftin' Kimmie's Holiday Card Making Kits! 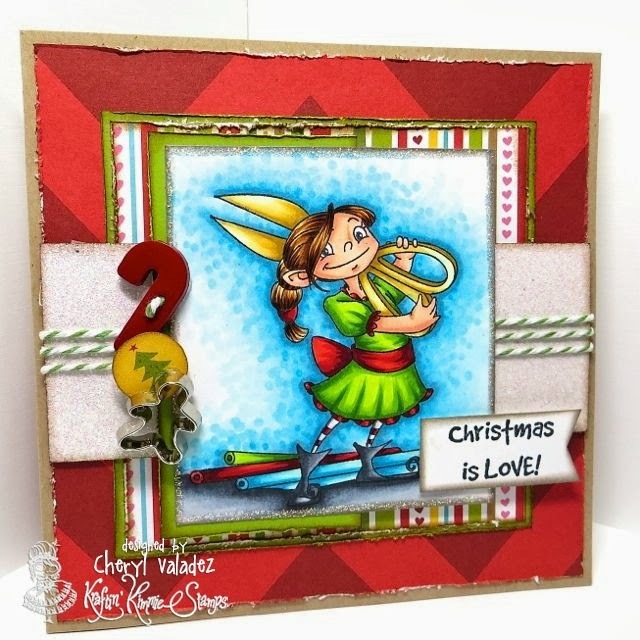 We've had such wonderful response at Kraftin' Kimmie Stamps to our Holiday Kardmaking Kit, that we thought we would do a little follow up HOP about it!! As you hop around today you'll be able check out SIX fabulously festive creations from the Krafty Girls that were ALL made using only ONE KIT!! They of course used their own ink, colouring medium and white paper, but everything else can be found in these fabulous KITS! In case you haven't heard, here's a little bit about the kit! We’ve taken our krafty know-how and done all the designing for ya!! We’ve chosen and coordinated patterned papers, cardstocks, envelopes, twine and several different types of embellishments and you’re ready to go!! With the September kit, you’ll also receive YOUR CHOICE of one of our gorgeous $8 stamps!! Choose whichever one you like from our many lines and styles of rubber stamps! I chose Christmas is Love! And with this kit you'll receive a gorgeous colour handout, emailed directly to you, featuring pictures of the six cards PLUS some extras and the sketches to go with each creation!! It couldn't be any easier!! - 1 pkg of assorted holiday Buttons, embellishments and charms! - YOUR CHOICE of any $8 stamp from ANY of our lines of stamps for FREE! Your Krafty Kit will be shipped in a sturdy box so that your goodies are nice and safe!! The VALUE of each kit is over $32 but our price this month is $25!! shipping in Canada and the US is $12 PLUS when you order the kit, we are offering FREE additional shipping on anything else in the shop that you order at the same time! All your goodies will be shipped together in a box for only $12. That means paper pads, ezmount, storage panels and lots more STAMPS!! (International customers please email me directly to go over your options for the kits!) FREE SHIPPING? Doesn't get any better than that!! ***Not only that, but here’s a little special for all you krafty peeps ordering the September Kit: when you order the new kit, you will also receive 10% off the August kit when ordered at the same time!!! And again, only the ONE flat rate shipping! Message me for details! So go ahead and check out the samples from the Krafty Girls listed below and keep in mind, they were all made using only the contents of ONE kit...and of course, their choice of Kraftin' Kimmie Stamp! Then head on over to the Kraftin' Kimmie Shop and grab one for yourself!! Love your little elf girl card! Too cute!! Lots of Awwww factor! Beautiful coloring and a cute image! Hello my dear Cheryl, it's been a visual delight to visit, all the peeks are stunning,your cards are the BOMB **** every single one, just gorgeous, thanks for sharing your awesome talent, my DS has been visiting, now that she has left life can get back to normal and I can get to my desk :), hope you have a wonderful weekend..